VIAVI Reports on the State of 5G Trials and Deployments Worldwide | VIAVI Solutions Inc.
San Jose, Calif., February 21, 2018 – VIAVI Solutions (NASDAQ: VIAV) today released new industry data on the State of 5G Trials around the globe. As mobile operators race to deliver next-generation services for subscribers and IoT connectivity, the pace of 5G field trials and deployments has rapidly accelerated during the past six months. A total of 72 network operators are already testing 5G – nearly three times the number conducting trials at this time last year – with 28 of those reporting they are in field trials. An additional 28 operators have announced plans for 5G trials. Even more significantly, two service providers in the Middle East have launched pre-commercial 5G services with limited availability – Etisalat and Ooredoo. Reports from ongoing 5G trials indicate that a handful of operators are reaching blazing fast data speeds. In fact, four operators have reported reaching a speed of 70 Gbps — Etisalat, Proximus, Telenor and Zain. The average speed, however, is much lower, with six operators claiming speeds in excess of 35 Gbps, and another six reporting a speed of 10 Gbps. Despite the fact that the 3GPP 5G new radio specification has only recently been completed, 14 network equipment manufacturers have announced involvement in 5G trials. To date, these trials have been conducted across a broad range of bandwidths, ranging from sub-3 GHz to 86 GHz. Of the operators disclosing their test spectrum, the most commonly trialed wavelength is 28 GHz, with 21 operators using it, followed by 15 GHz. The complete “State of 5G Trials” infographic is available here. The data was compiled from publicly available sources for information purposes only, as part of the VIAVI practice of tracking trends to enable cutting-edge solution development. 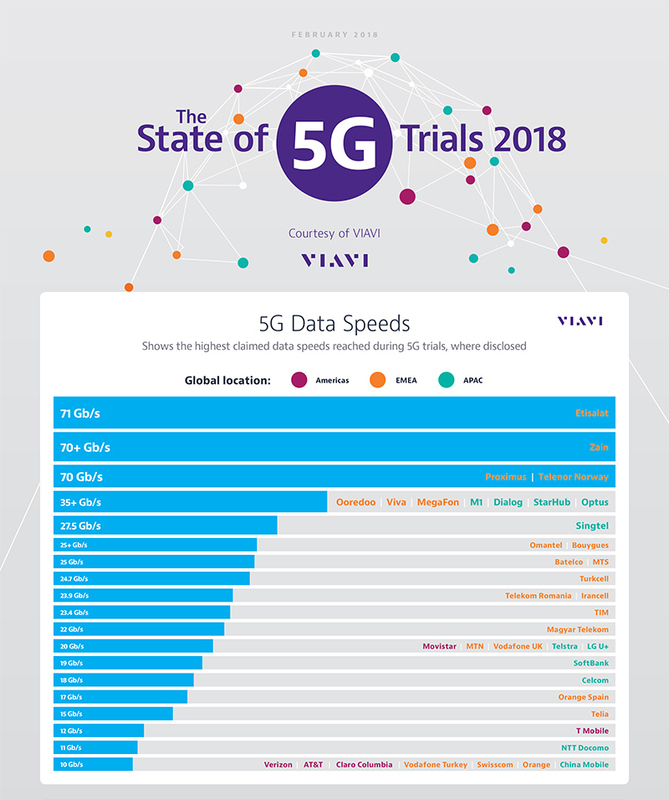 The VIAVI “State of 5G Trials” serves as a companion document to the VIAVI Gigabit Monitor, a visual database of gigabit internet deployments worldwide. At Mobile World Congress 2018, VIAVI will showcase real-world solutions that are available today, lighting the path to the 5G mobile communications ecosystem of tomorrow. Contact VIAVI to schedule a meeting to learn more about end-to-end assurance, analytics and optimization solutions for hybrid and virtualized networks, as well as test and measurement for IoT, centralized RAN (C-RAN), and the evolution to 5G.